Arteriography allows doctors to view the coronary arteries of living patients. This procedure can aid in heart disease diagnosis and treatment. work harder to pump blood through the clogged opening. An artery can eventually become totally blocked, stopping blood flow to and from the heart, causing cardiac arrest (the most severe form of heart attack). In order to treat the disease before a heart attack occurrs, physicians needed to see how clogged the arteries actually are. Early attempts at coronary arteriography were hindered by two major problems. First, massive amounts of contrast agent, or dye, had to be injected into patients. This often caused serious side effects. Secondly, only a single radiographic plate was obtained for each injection. Improvements to the process came with the introduction of serial film changers in 1949 and the image intensifier in 1949, which allowed true motion cinematography. 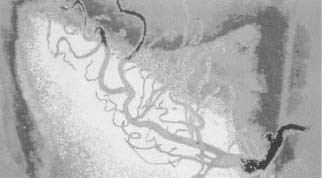 The technique remained less than ideal, however, until 1958, when an accident led Mason Sones to the development of selective coronary arteriography. Arteriosclerosis is a very old disease. It occures when abnormally high levels of cholesterol (a fatty alcohol) and other lipids in the blood leave deposits on arterial walls. The disease is especially common in industrialized nations, where treatment procedures have been slow to develop. Lifestyle change is the most widely recommended remedy. These changes may include a low-cholesterol diet, no smoking, weight loss, and a physician-supervised exercise program. Sones was working in his laboratory at the Cleveland Clinic with a huge, heavy image amplifier that required the physician to stand in a pit beneath the patient's table while an assistant on the platform above injected the contrast agent via a catheter (a slender tube inserted into the body for the passage of fluids). The injection was supposed to be made into the aorta, a major blood vessel, rather than the heart itself. This was because the direct-heart injection could cause the heart to go into ventricular fibrillation (an irregular contraction that frequently causes cardiac arrest). The catheter slipped, and Sones was horrified to see the injection travel into the coronary artery itself. Fully expecting the patient to go into fibrillation, Sones was very surprised when the patient did not. The physician concluded that selective doses of smaller, more diluted amounts of contrast agent—introduced directly into individual coronary arteries—would finally make consistently clear arteriography of selected coronary arteries possible. After other researchers improved the technique and catheter design, Sones's coronary arteriography became widely used. It helped thousands of patients to receive effective treatment of accurately diagnosed coronary artery disease.